Make your Halloween homemade this year with these 30 Homemade Halloween Candy Recipes. Everything's better when you make it yourself, and the same goes for candy. These treats are so delicious you'll never go back to the originals. With these copycat recipes, you can make your Halloween your own brand of spooky. Customize these recipes and make them unique! No matter what your go-to Halloween candy is, you'll love these. You don't have to feel badly about how much was spent on Halloween candy last year, just try something new and make Halloween candy at home! The most popular Halloween candies are easy to make, whether you're looking for classic Halloween candy like candy corn, or homemade candies like chocolate candy bars. But the best part of these recipes is that you know exactly what is going into them! Too much candy? Check out these 22 Leftover Halloween Candy Recipes. You can never go wrong with a candy bar, but sometimes that candy bar craving hits when you least expect it. Satisfy that craving with these easy homemade candy bar recipes. With these candy recipes you can have your favorite candy bar whenever you want it without having to make that annoying trip to the grocery store. Can't get enough candy? 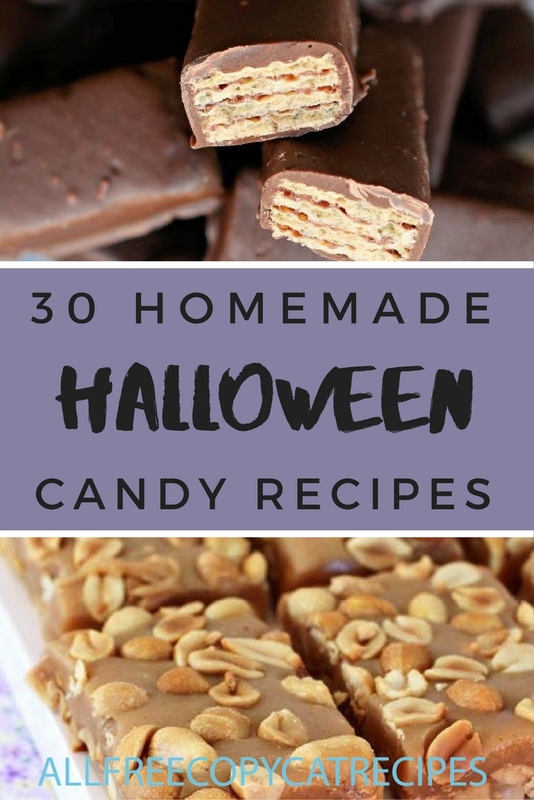 Check out this eBook: 13 Best Homemade Halloween Candy Recipes! If candy bars aren't your thing or if you are looking for a more creative candy recipe, these recipes are exactly what you need. From rock candy to Reeses, there's something for everyone. Try out these candy recipes for your Halloween party for a treat that will not disappoint. What's your favorite Halloween candy copycat recipe? Be sure to let us know in the comments.